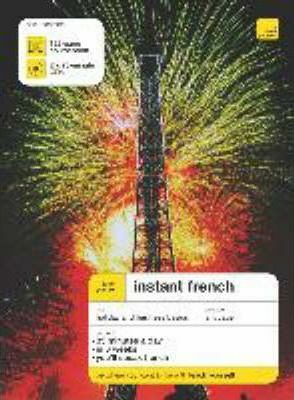 First published in 1998, the Instants have established themselves as the best-selling range of language titles from teach yourself. When published as part of the teach yourself relaunch in May 2003, they were given a new cover, internal text re-design and availability on CD for the first time, but now they have undergone an extensive revision, with 16 more pages to give room for additional exercises and flashcards, and an extra CD to double the amount of audio practice. The 35-minutes-a-day, six-week course is highly structured and has a fresh approach to language learning which appeals both to readers who have not learnt the language before and to those with some basic knowledge of French. The author has used her wide teaching experience to refine the course so that it covers only the grammar (explained in no-nonsense English in the book and on the CDs) and vocabulary which are really necessary. Her day-by-day, no-nonsense programme is easy to follow and fun to do. At the end of six weeks, readers have the confidence and knowledge to tackle all the situations they'll need to know about, such as shopping, eating out and getting around. With fewer than 400 words to learn, and flashcards at the back of the book to help learn them, progress is fast and enjoyable. Sales of the Instants (over 150,000 units since in the last two years) have established Elisabeth Smith as the UK's leading language author (Bookscan figures) and her large amount of fan mail is witness to the success of her unique method. The book (0340914572) and CDs (0340914599) are available separately. Elisabeth has combined teaching languages all over the world for more than thirty years with her career as a very successful businesswoman. She wrote the first Instant title to teach her daughter to speak German and since then she has written a steady stream of best-sellers while keeping up her teaching to ensure that her books are based on first-hand experience and reflect the needs of her students.